Review of Cranberry Blend from the Downeast Cider House, their winter seasonal. They sent me a great sample case of their Cranberry, Winter, and Original Blend ciders, which is especially awesome as they aren’t yet available here in the Seattle area (or anywhere outside of the Northeast). Lucky me! Availability: Year round, in the Northeast portion of the U.S. See their locator map. Cider Description: Fresh-pressed cranberries make for a tart, crisp finish. After every batch of Cranberry Blend is finished and ready for the conditioning tank, our head cider-maker, Noah, finds Tyler and hands him a small cup. Tyler takes a sip, contemplating the flavor, the body, the finish, the metaphysical implications of spinning around a dying star on this piece of rock we call planet earth – before making the declaration as old as time itself: “more cranberry.” And so it goes, a ceremonial dash of freshly pressed cranberry juice tops off the batch and it’s whisked off to its cold, bubbly destiny. Cidery Description: Downeast Cider House was founded by Ross Brockman and Tyler Mosher during their senior year of college. After a considerable amount of time spent on the family orchard, an affinity for farm-fresh apple products was born. Meanwhile, at school, the guys could always be found studying. Whether it was deep into a weekend night, Wed/Thurs specials at the local library, or perhaps a casual “Sunday fun-day study-day,” the fellas were relentlessly toiling away, focused primarily on the classic works of Professor Busch and his famous theories on the smooth-cold continuum, copper-top revision. And so it was set. Where others have used juice from concentrate, “natural flavorings,” “essences,” artificial sweeteners, and an endless list of excuses, Downeast Cider House has a firmly established policy of NO SHORTCUTS. No matter the cost to us, we are fully committed to using only fresh-pressed juices and pure, natural ingredients in our cider. When it comes to flavor, there’s no substitute for the best, and that’s what we stand by: simple, honest, authentic. They were founded in 2012 and have a tasting room in the Boston area. Here is a nice interview, although old. First Impression: Hazy bright straw yellow with a hint of pink. Smells of unfiltered cider, yeast, citrus, and a hint of tart cranberry. Opinion: On the drier side of semi-sweet. Full-flavored and apple-forward. Lovely flavor influence from the lack of filtering, although it remained medium bodied. I pick up some mild citrus, honey, and tart cranberry. Mild acidity. Mild to moderate tartness. No bitterness, sourness, or funk. Unfiltered. No to low carbonation. Medium length finish. Best enjoyed very cold. The cranberry flavor remained very mild, and was expressed more as some additional tartness. I was surprised that the cranberry juice didn’t significantly tint the cider, which shows how little they likely added. This is a year-round variety, and I think most folks would be able to enjoy it year round as it didn’t seem overly holidayish like many cranberry ciders are. Most Similar to: J.K.’s Scrumpy, except not nearly as sweet. Besides that, this cider is pretty original. Closing Notes: Very tasty! I found this cider very difficult to describe. My review comes across a bit simple, yet for a relatively simple cider I found this quite complex. Especially for the retail price, I was quite impressed. I usually find canned cider to be a letdown for whatever reason. I opened all three Downeast varieties at a cider tasting and they all got two thumbs up from everyone. Its definitely an easily likable cider. The Original however was everyone’s favorite of the three varieties, although only by the slightest bit. Hopefully Downeast makes it out to the Seattle area someday, where I’ll save it a place in my fridge. 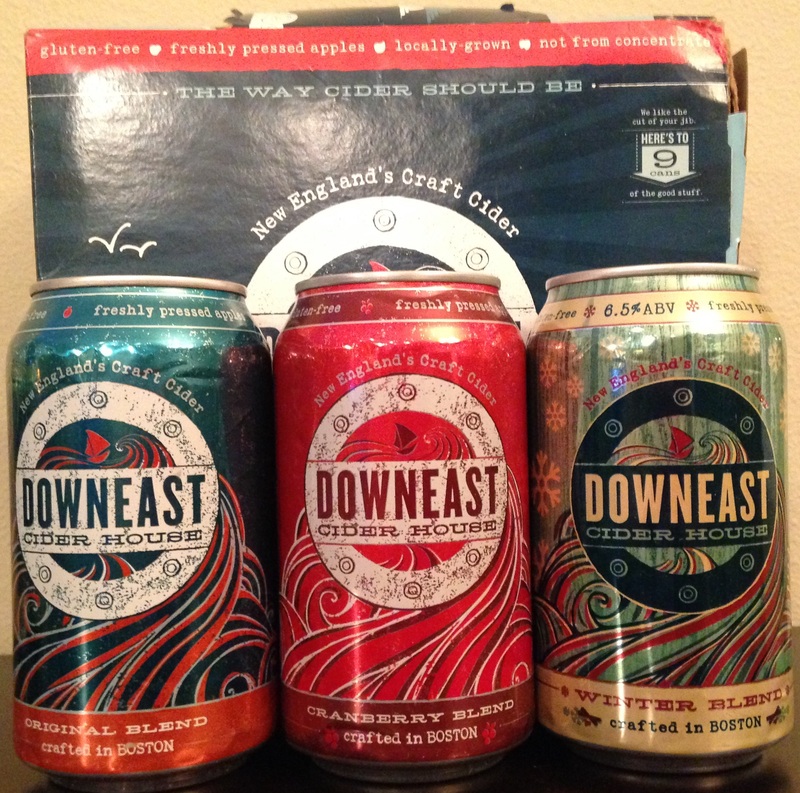 Have you tried any ciders from Downeast? What did you think?